I had already flown Austrian Airlines Business Class across the Atlantic at the beginning of my trip, and I was generally disappointed by the experience. The lauded food and coffee service was lacking because the airline failed to plan its staffing appropriately, and the actual service provided by the flight attendants was indifferent at best. This time around, my flight had the full food and coffee menu, and the food was actually quite good, but the service was absolutely horrid, and several flight attendants need serious retraining. I was offered a pre-departure beverage and chose Austrian’s cocktail, which was okay. I settled into my seat, and everything about the hard product on Austrian is slightly better than that of Swiss, as it seems a little newer, the screen is better quality (although the selection is worse), the screen is a touch screen, and the seat controls are nicer. I started noticing deficiencies in the service almost immediately with the onboard chef. He was the meanest, least helpful crewperson I’ve seen onboard a plane in any class of service. He was extremely gruff and curt, and he was completely unwilling to engage in conversation. I overheard people asking him for recommendations, and he seemed exasperated that someone would even bother to waste his time. He would also tell passengers things like, “I’m just the chef on board, I can’t help you with that”, and not offer to find someone who could help. Beyond the terrible service of the chef, no one else on the crew seemed to be at the standard of an international business class product. I had to ring my call button multiple times to get trash taken away, and even when I would ring the button and I would ask the person to take certain items, they wouldn’t take everything so I’d have to ask someone else. If you needed to go to the bathroom during a meal service, they wouldn’t get out of the way, nor would they make room for you in the galley. And I didn’t get a single response to a pleasantry or a thank you. Service aside, the food was actually quite good. The appetizers were all pretty tasty, to the point where I wouldn’t mind paying for that sort of food on the ground. I opted to get the soup, which I’d say was considerably better than the soup that I tried in the Lufthansa First Class Terminal, and the chocolate dessert was probably the best dessert I’ve ever had on a plane. The entree was a little bit tasteless, though. 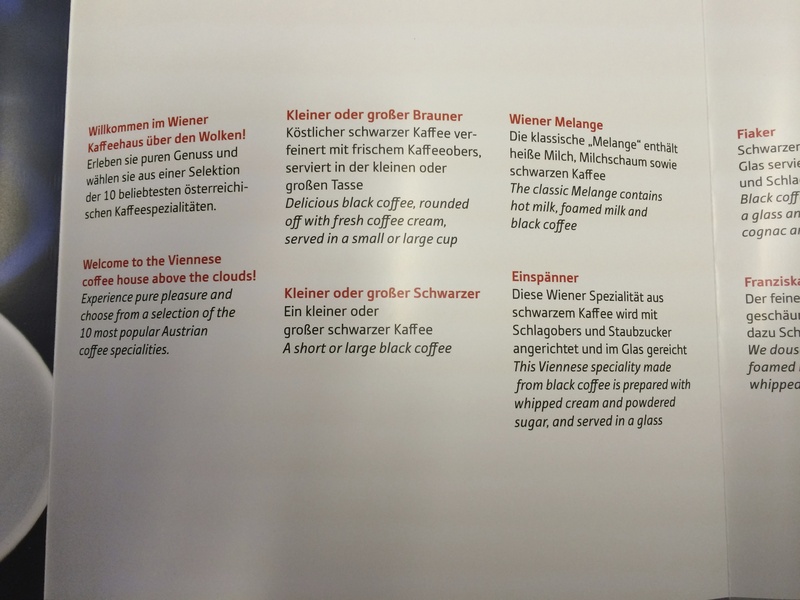 Overall, I really, really wanted to like Austrian given their great hard product and good food, but the service is the worst I’ve experienced in any international business class product. They have so much to offer, but I never felt the sense that the flight attendants were there to serve or make my flight more pleasant. I know that many others rave about Austrian, so perhaps I should chalk up my two bad flights to bad luck with crews, but Austrian will definitely be at the bottom of my list of airlines to fly in the future. This entry was posted in Austrian, Travel, Trip Reports and tagged austrian, business class, travel, trip report on January 31, 2014 by Edward. Is the service genearl not so gerat or is it because you are Asian so they treated differently like your experience before? Eg: be spoken loudly and slowly…I flew them a couple of times between VIE and BKK and ORD and generally find the crews are quite friendly, though somtimes not as polished and effienct as I hope. I saw a lot of examples of the crew providing bad service to other passengers, so I don’t think this was anything specific to me. Perhaps I’ve just had bad luck with Austrian crews.